Discover all the beauty and charm of Miami on your own US1 Scooter Rental. Whether you are looking for an exciting sightseeing adventure around the Miami area or Vacation Transportation while in Miami our Scooter Rentals provide the cool and comfortable way to ride with wind in your hair and the sun on your face. 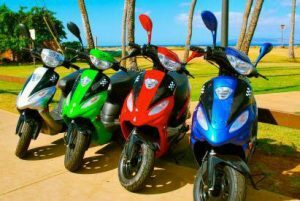 US1 Scooter Rentals with our company is the premier place to rent scooters when you’re in Miami, FL. We are open 9:00 am to 7:00 pm 7 days a week. We are conveniently located on 11510 Biscayne Blvd. Miami FL 33181. 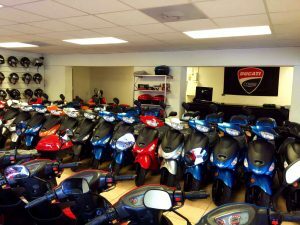 US1 Scooter Rentals has a large inventory of scooters and offer the best quality rentals in Miami. We offer the latest scooters and routinely upgrade our fleet of rentals. Our staff is very friendly and will be sure to point you in the right direction for things like restaurants and points of interest. Renting a scooter is as simple as presenting your driver’s license and credit card (Visa, MasterCard and Discover). Important : Any person renting or driving a scooter must have a valid driver license, which must be carried and exhibited upon demand Minimum Age – No person under the age of 18 is allowed to rent or drive a rental scooter Gasoline – At renter’s own expense Helmets – Not required by Florida law, however helmets are provided on request per 5$ Deposits – $200.00 security deposit required on departure date by credit card (authorization only) or cash.